Jiří Havlík studied French horn and composition at Prague Conservatory and at the Music Faculty of the Academy of Performing Arts in Prague. He won several prizes at international music competitions (Concertino Praga, The Prague Spring), as well as Special Award of the Czech Ministry of Culture, for the composition and performance of his Concerto for French Horn and Strings. Member of the Czech Philharmonics since 1979, he has also been actively pursuing solo and chamber playing careers (e.g. with the Prague French Horn Trio and the Czech Wind Harmony). He is known for his compositions such as Three Fugues for Three French Horns and Piano, or Mileniana for a Horn Octet, or Stages for Brass Instruments, as well as a piano cycle titled (Anti)Clavierness. As a conductor he participated in the international project of Czech-German Symphonic Orchestra in 2007, 2008 and 2010. In 2002 he co-founded the chamber orchestra Camerata Filarmonica Bohemia, featuring as its dramaturgist and artistic leader. Since 2003 he has been conductor of Benda Chamber Orchestra (Usti nad Labem). 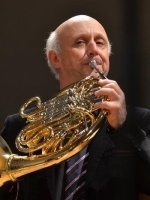 He has been a co-organizer of the Ameropa International Music Festival and Chamber Courses (1997-2007) and The Prague Horn International Music Festival (since 1997).